Nylon trade show organizer with length adjustment slider. Window shows 4-7/16" x 3-1/8" card. Back side features 2 pockets and pen slot. Strap size 1/2" x 16" per side. NOTE: Pouch and strap color will NOT exactly match as they are two different materials. 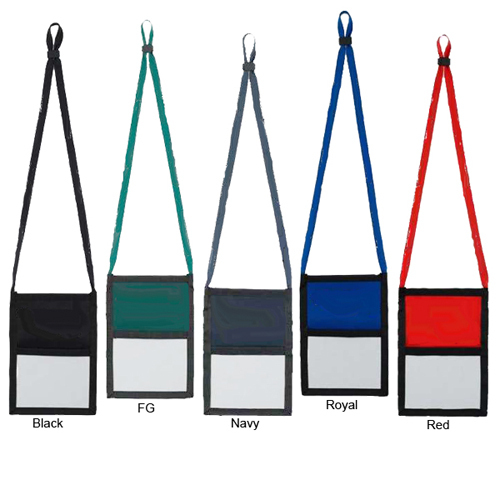 Overall dimensions: 7-1/2"H x 5-3/8"W.
Imprint Area: Pouch 3" x 1", Neck strap 3/8" x 12".